NOTICE: The Western Reserve Matinee Club, established in the early 1950's has officially disbanded as of December 31, 2003. If you are interested in Matinee racing it is suggested that you look into joining an Amateur Driving Club. The Western Reserve Matinee Club was established to promote harness horse racing in north central Ohio and educate people about the great sport of harness horse racing through Matinee racing. In recent years, the Club had become a loose formation of Wayne County, Ohio racehorse people interested in the racing and training of Standardbred horses at the Wayne County Fairgrounds. 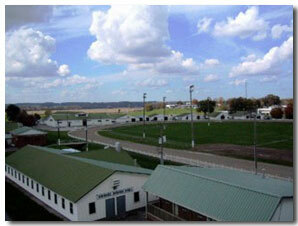 The Club held fund-raisers throughout the year to contribute toward the upkeep of the racetrack and related equipment. They were a non-profit organization that relied heavily on volunteer contributions. However, with no-one willing to contribute their time or having an interest in continuing Matinee racing, the Club disbanded. For eleven months out of the year there were approximately 17 USTA licensed trainers preparing Standardbred racehorses at the Wayne County Fairgrounds for racing at any of the four parimutuel racetracks and the many Fair Stakes racing opportunities that exist in Ohio. Among this group were Public Trainers and Private Trainers with any where from one or two horses in training to a full stable of 20 horses or more. Site no longer maintained after December, 2003. We're putting this in so we don't get sued, harassed, and or arrested. Anything on this websites' pages written or drawn by us is copyrighted by us. Anything we did not write ourselves, we have given credit to the original author, and that page/article is copyrighted to the original Author.